I would definitely bet that when Alastair and Jonathan launched Advent Botany in 2014, they never imagined that the annual series would still be going four years later! I thought their idea was fun and original, and I contributed to posts on popular North American festive plants: red-osier dogwood, poinsettia and amaryllis. Since then, Advent Botany has entertained and educated me about the dizzying array of plants involved in Christmas traditions all over the world. I’m positive that botanists will continue to tell us about many more plants that have Advent associations. After all, there are over 350,000 species of flowering plants, but this year, I asked to revisit one of my favourite bog plants, the cranberry. 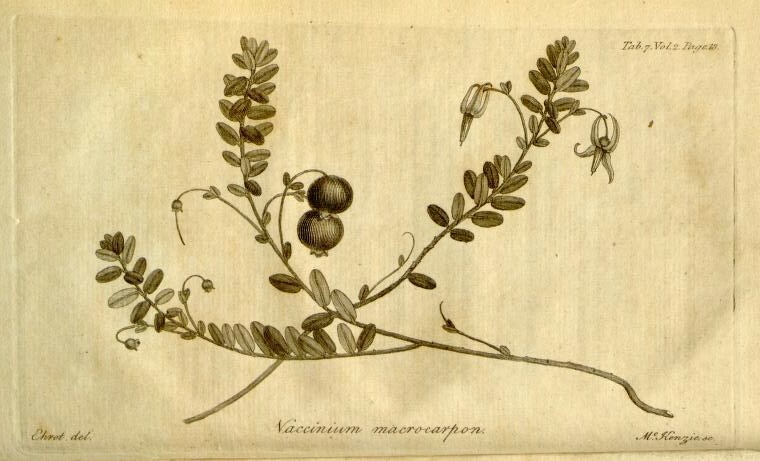 Not the European species, Vaccinium oxycoccus, but rather, its North American relative, Vaccinium macrocarpon, which has a much larger berry. Due to widespread cultivation, which dates back 200 years, the North American cranberry has transcended its seasonal role, from the sauce served alongside turkey at Canadian (October) and American (November) Thanksgivings, and Christmas celebrations, to its use as a decoration. 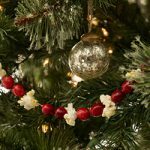 Cranberry and popcorn garlands are an old-fashioned, biodegradable way to decorate Christmas trees. Cranberry juice and cranberries, which freeze and dry well, are available year round. One of my favourite recipes is Cranberry Nutmeg Dumplings from June Johnston’s The Cranberry Cookbook, a spectacular and spectacularly easy stove-top dessert, that will wow your friends. 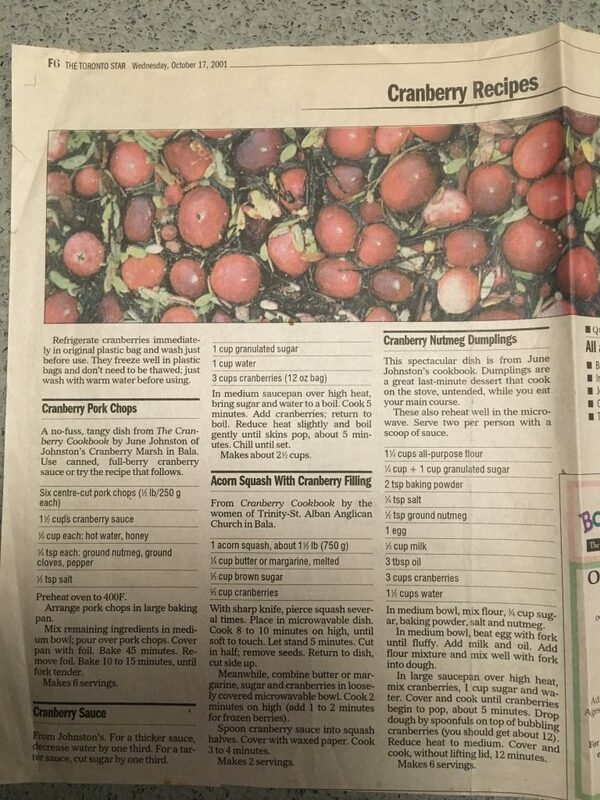 I clipped and kept this reliable recipe from the October 17, 2001 issue of the Toronto Star. Cranberries also have medicinal properties. Drinking cranberry juice is a popular preventative for urinary tract infections, and research backs up their effect (Lynch 2004). 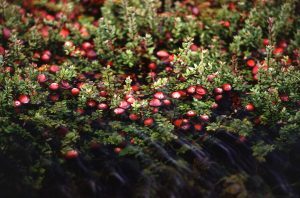 Well before supermarket juice dominance, the North American cranberry enjoyed a rich and important history of use by First Nations. 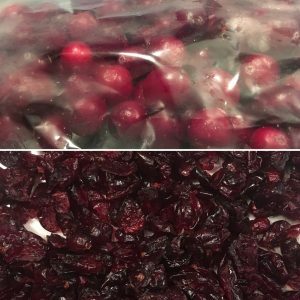 Julia Blakely’s superb post at the Smithsonian Libraries Unbound Blog, Native Fruit: Cranberry for all Seasons, tells us that cranberries have been harvested by the Wampanoag Nation for 12,000 years. Founded in 1969, the Iroquois Cranberry Growers, to the north of Toronto, had expanded their commercial cranberry marsh to 68 acres, to become Ontario’s largest cranberry farm. Unfortunately, over time, a flood of cranberries on the international market drove prices down from $1.45/lb in the mid-1990s to around 27 cents/lb, leading Wahta Mohawk First Nation, which owns Iroquois Cranberry Growers, to announced its decision to close one of my local cranberry businesses. You can catch a glimpse of 19th century commercial cranberry agriculture from The Cranberry and its Culture (Eastwood 1856) and the Bradley Fertilizer Company’s The Cranberry (1892), which you can download from the Biodiversity Heritage Library. Johnston, June. 2000. The Cranberry Cookbook: Recipes from 40 years of cooking with cranberries. Johnston’s Cranberries. Bala, Ontario, Canada. Lynch, D. M. 2004. Cranberry for Prevention of Urinary Tract Infections. American Family Physician. 70(11):2175-2177. Eastwood, B. 1856. The Cranberry and its Culture. New York, C.M. Saxton. Weller, Keith: Wikimedia. Cranberry Marsh https://upload.wikimedia.org/wikipedia/commons/3/3a/Cranberry_bog.jpg citation: Photo by Keith Weller [Public domain], via Wikimedia Commons.